Buzludzha, the remnant of the communism past in Bulgaria. 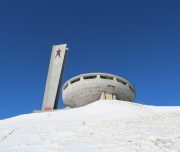 Buzludzha monument was created by the people and destroyed by the people. The abandoned monument is with a rather peculiar shape. If you look closely, you will see it has the shape of an UFO. This abandoned building is more popular abroad and hated by the locals. 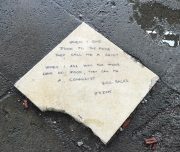 Because it reminds them of the communism period in Bulgaria. 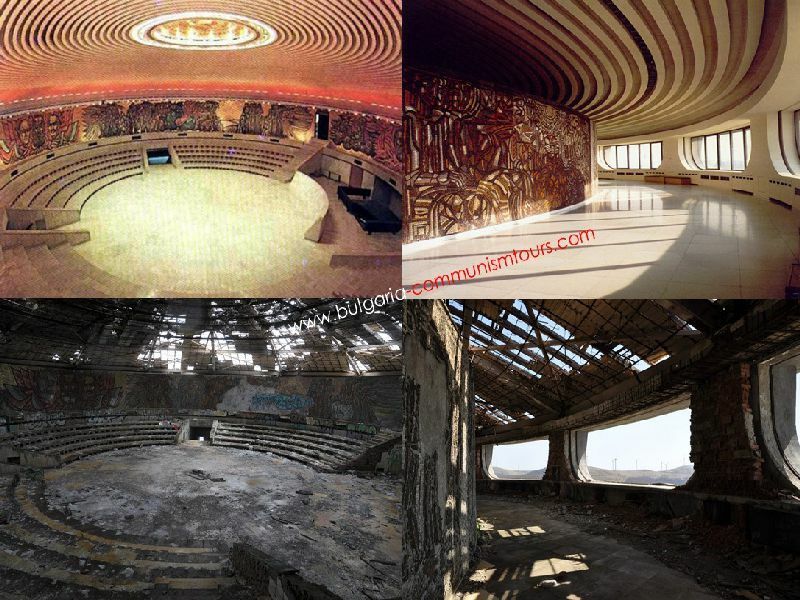 Buzludzha was an office of the communism party. The chief architect Georgi Stoilov wanted everyone to take part. So the party collected donations. And each family had to participate by buying stamps. In the end they collected 14 000 000 BGN. 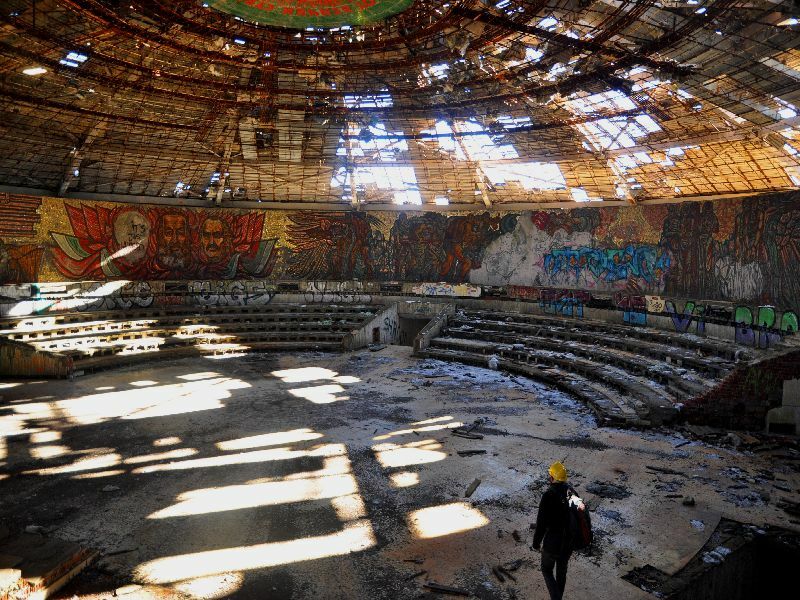 In 1981 Buzludzha was officially open. The idea was that the building will last at least 100 years. But today, only 35 years later, it is one of the lost places in Bulgaria. 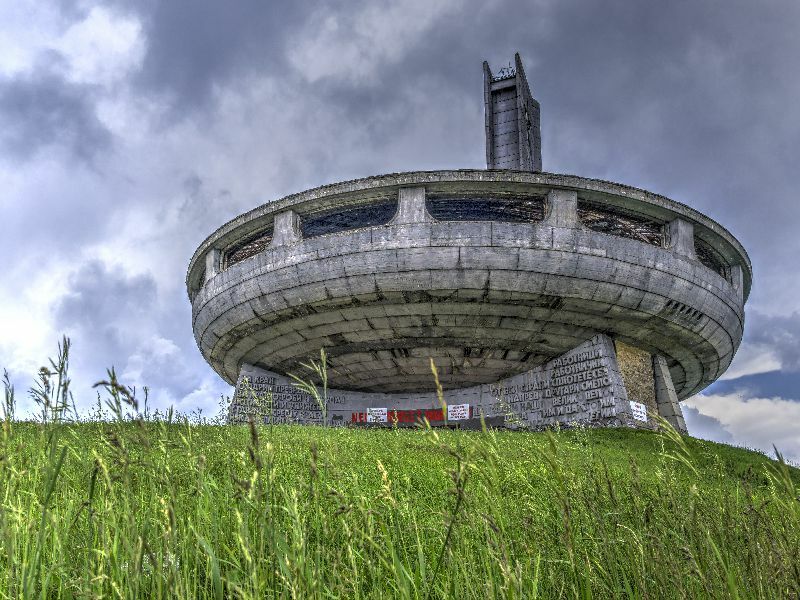 With our one day Buzludzha tour we bring you back in the past. 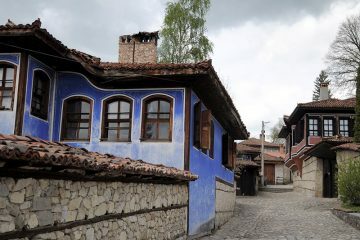 We will explore the architecture from the communism period in Bulgaria. 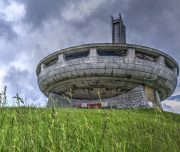 With its amazing location and size, Buzludzha monument collects all memories of one generation and their wish to forget. But we believe that history needs to be remembered. Because we think some events should not repeat. 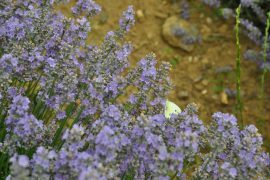 While touring Bulgaria, you will taste local drinks and food. We will bring you back in time with sharing with you old photos, money and newspapers. Be a comrade and pioneer just for one day with us! 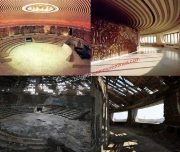 Extra information The institutions closed the entrance to Buzludzha in the summer of 2016. We can get right next to the monument but we can’t go inside. There are cameras and alarm sensors on the monument to prevent people from going inside. Visitors can see it only from outside, no entry is possible. 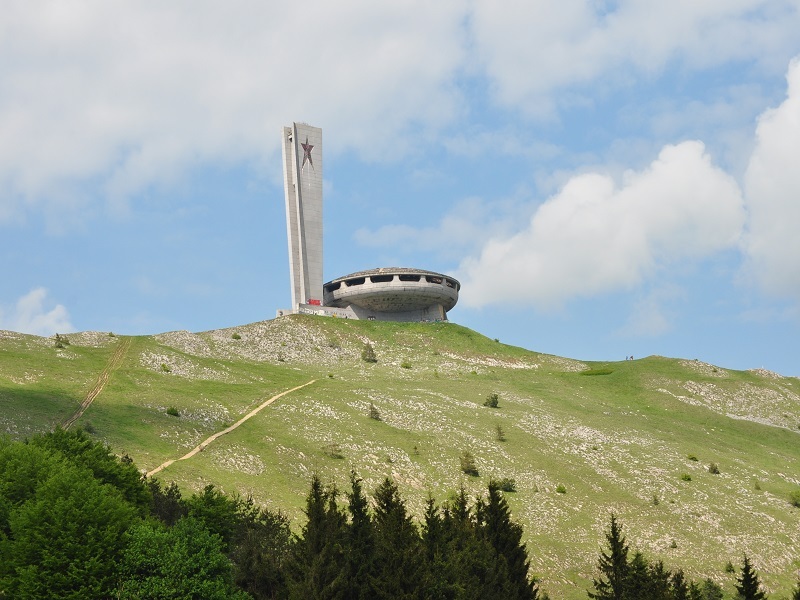 We can combine Buzludzha tour with either Plovdiv, Shipka monument or Shipka memorial church. Meeting at your accommodation in Sofia. 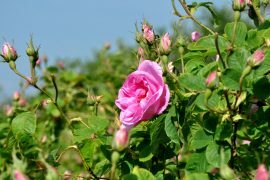 Departure in direction to Kazanlak, located in the Rose Valley of Bulgaria. During the drive we will listen to Bulgarian music from the past. 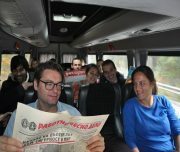 We will show you old newspapers and magazines. And we will share with you personal stories and memories. 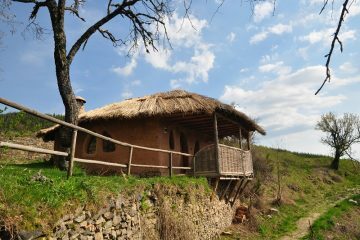 We will let you taste traditional Bulgarian breakfast with local drinks from the past. 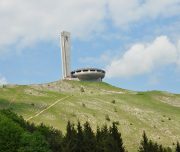 Sightseeing of Buzludzha monument from outside. We will stay enough time for you to take photos. We will have lunch at a local restaurant in Kazanlak. This is also the time for a beer or rakia. You are not driving. Just enjoy. Departure to Sofia. (approx. 4 hour drive). Arrival in Sofia. Drop off at your accommodation. Yesterday, I went to the Buzludzha UFO monument. Luckily for us when we reached the top it was snowing and this gave the sight an extra feeling of excitement as we had to walk a bit before reaching the monument. Then suddenly when you are close you start seeing the monuments shadowy figure and shape (due to the fog you couldn’t see it immediately). So with the snow and the shadowy figure it gave the feeling like you are in a movie walking up towards this construction in a UFO shaped form, which gave it a really nice feeling. Also, on the way to the monument we tried some local breakfast that Bulgarians have called Banitza and also tried the Bulgarian Soft drink that most of the foreigners don’t like, well except for me. Not forgetting to mention having some traditional food for lunch and the information provided during the tour was really great. I highly recommend coming to visit Bulgaria and taking part in the communism tour!! 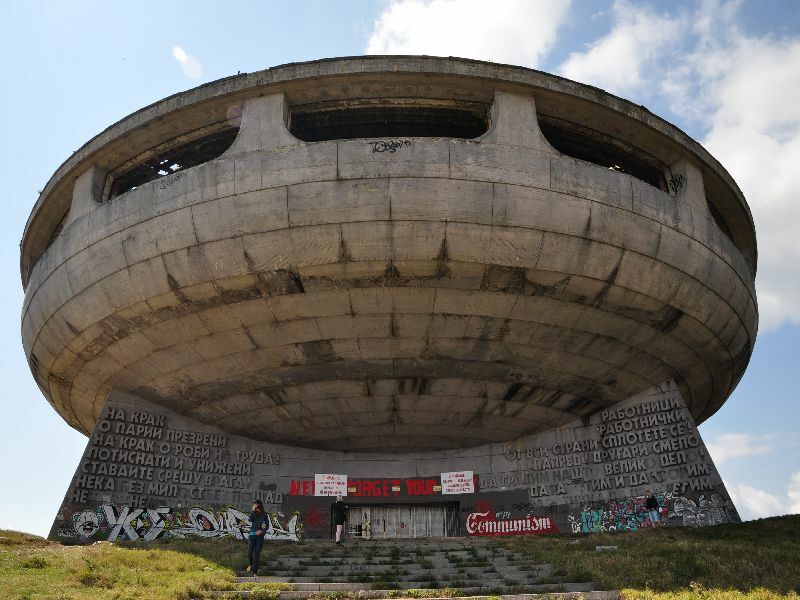 I went to Bulgaria specifically to see the Buzludzha Monument, after reading about it online. I’m very glad I chose nvision travel to take me there. I was picked up at my hotel, and then we drove for several hours to reach the monument. 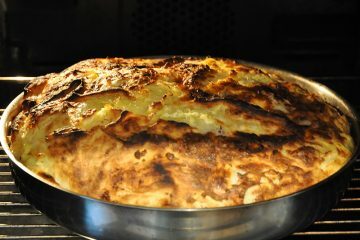 On the way, we stopped for Banitza – a Bulgarian breakfast made of cheese and pastry. 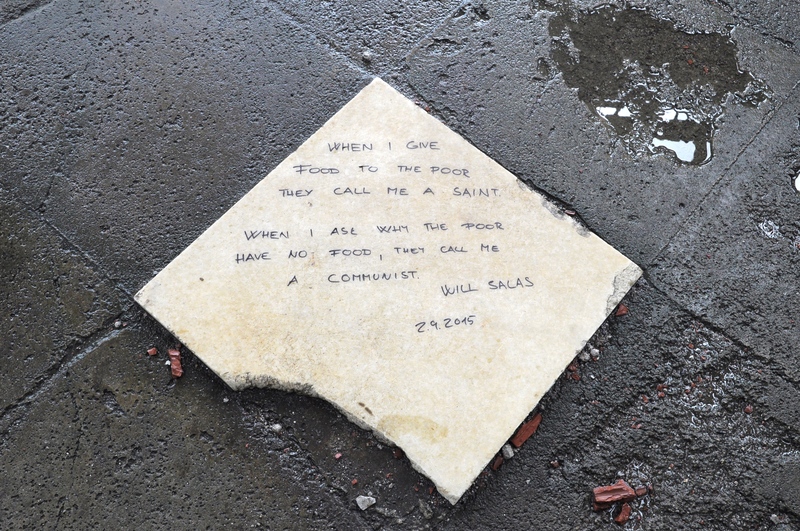 During the trip, I heard lots of stories about what life under communism was like, and stories about the Monument (including the inventive way it was funded). I first caught a glimpse of the monument from a few kilometres away and it send a shiver up my spine. The monument is even more imposing up close. It’s a huge structure and it’s remote location just enhances the drama of the building. On the way back, I was told more stories about life under communism and I was also shown a video of the original architect of Buzludzha going back to it now it is in ruin. It was very emotional! 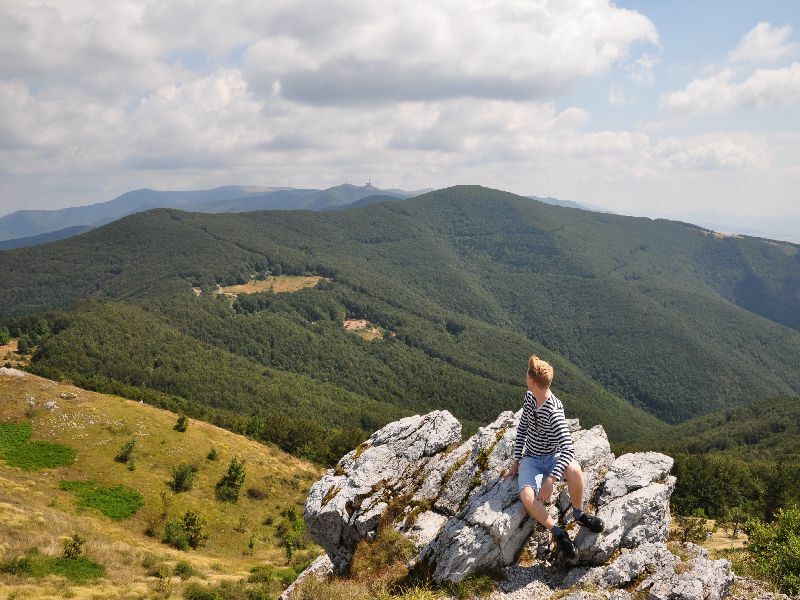 The trip really is one of those “once in a lifetime” experiences, and one I would highly recommend to anybody who is interested in life under Communism who is visiting Bulgaria. 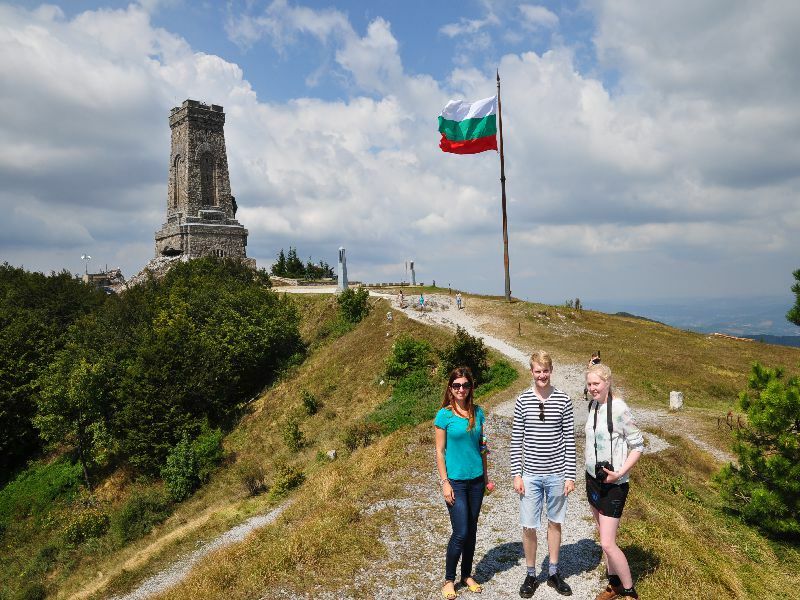 I really enjoy this tour and would recommend it to anyone who is travelling in Bulgaria. 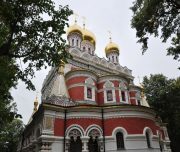 The two tour guides spoke perfect English and were extremely friendly, helpful and knowledgeable. Both had university degrees in tourism and could answer any question we asked and life in Bulgaria and history of the country. 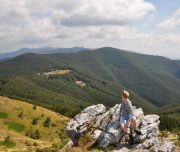 The tour itself went through a very scenic area of Bulgaria through mountains and villages. We also passed some cool sights such as burial mounts of ancient Thracian kings and flower farms. 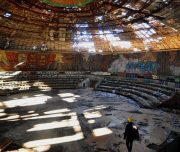 Visiting Buzludzha and the Shipka church was also amazing. Even though you cannot enter the Buzludzha monument right now it is still worth seeing just for the views of the mountains and to walk around the building. On the trip we also listened to traditional Bulgarian music, tried local food and saw some items from Bulgaria’s past (such as old money and newspapers). This was really interesting and you wouldn’t get this level of insights if you just rented a car to see Buzludzha yourself. 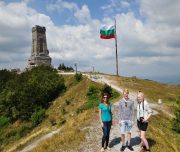 The guides also helped me to arrange bus travel to another city and recommended to me attractions in other parts of Bulgaria. In addition, the tour guides helped me out by sending photos they took of the trip after I had my phone stolen and lost my photos (not during the trip). First things first: Beni and Betty are amazing! We took 2 tours with them in winter and they were both fantastic. This particular tour worked out perfectly for us as they were flexible enough to drop us off in Plovdiv after the tour. 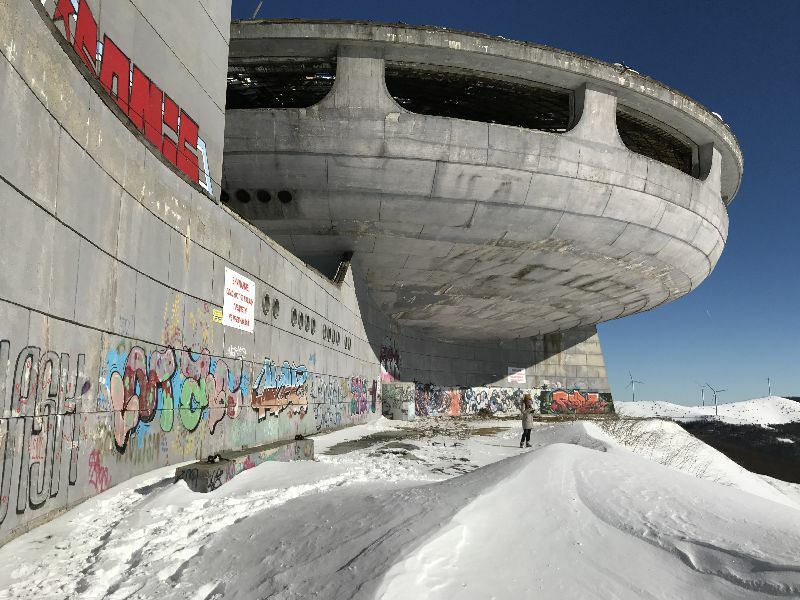 We had a very unique experience with them in Buzludzha as it had snowed heavily the night before and the road up to the monument was closed! So we had to hike our way up which was quite a workout but such a unique way to reach it. I honestly think the whole experience was enriched by having to hike up! We were joined by another fellow traveler and that just added to the experience. Making new friends is always fun. And the lunch afterwards was the BEST meal we had in Bulgaria! Betty’s optimism and Beni’s outstanding driving skills are just some of the reasons we think this team is amazing. And the uniqueness and thoughtfulness of the tour planning made this trip one we will not forget. We left Bulgaria feeling we made new friends and hope to be back in the not to far future. 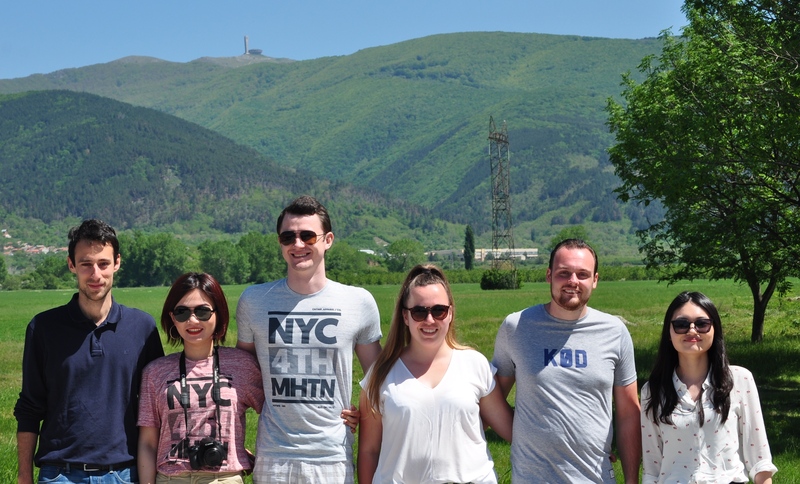 Upon staying in Bulgaria during a trip through Eastern Europe, I was lucky to have the opportunity to go on a day tour to Buzludzha with Beni. I would not be exaggerating when stating it was the highlight of my trip and that Beni’s guiding was fantastic. She is very personable, professional, prepared and fun. We tried local cuisine during the day and Beni prepared us with facts, while answering all our questions, during the drive. 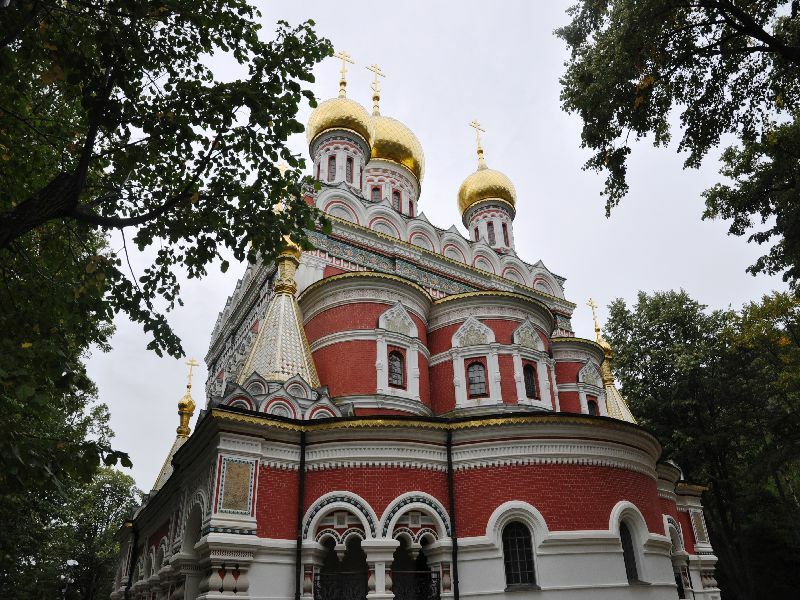 I really enjoyed learning about Bulgarian culture and history. And music! Buzludzha is quite simply amazing. The location, scale, history, and sheer sights make it a once in a lifetime event to experience. 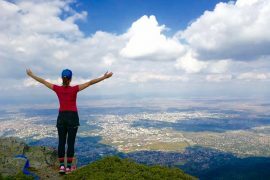 Not only was it a chance to see and feel something out of this world but also to embrace a country and culture that deserves more attention from travelers. I could not have asked for more from Beni, she is the consummate professional who genuinely enjoys her occupation, the people she shares these adventures with and an inspiring pride in her country. I would highly, highly recommend Beni and nvision travel and will book future adventures with them when I return to Bulgaria. 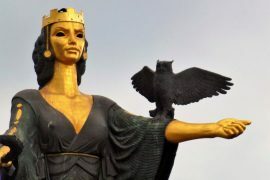 Could you possibly travel to Bulgaria and miss such a piece of history-art-sculpture-politics-landscape etc…? Absolutely not! The UFO-shaped building is a must if you travel to that beautiful country especially because the trip to get there is also worth the visit. 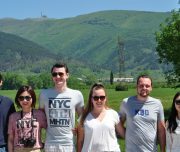 We didn’t know how to arrange such a trip, but luckily our hotel host suggested nvision travel and there started the fun. We were picked up by our two wonderful guides (Beni&Betty) who welcomed us on board with a map of the area we would have driven across, traditional sweets and big smiles to put us at ease and comfort! We drove all the way to the hilltop passing through gipsy villages, in the countryside and also a food truck where we for a quick local snack; there we learnt how Buza (typical drink) is made. Sooo tasty! Shortly after, we arrived on the windy hill and started the hike which lead us to such a magnificent building, which despite its condition still remains impressive and thrilling. Walking around the monument allowed us to “breathe” the scent of past times and peer inside the immense, almost-collapsing, space. It was a pity not to go in, but security come first and our two friends warned us about the possible consequences. Last adventure of the day (before returning to Sofia singing Bulgarian pop music and learning in the meantime how to say different words), was our visit to Plovid, its wall paintings, Roman theatre and charming city centre and streets. We also ate a delicious lunch, trying all the local cuisine specialities. And at the end of the day what is there left to say? That you had a tour across a beautiful land and its scenic views? No way and definitely that’s not all. We returned with two new friends with whom we still talk and write to, remembering our great day together. Bulgaria has this kind of magic.. it gives you things to see, to eat, to enjoy, but especially bonds to endure and carry on for the rest of your life! The other reviews make clear that Beni and Tsveti (aka “Betty”) are great tour guides, but the actual experience was so much better than I’d expected. Yes, they are friendly. Yes, they are knowledgeable and informative. Yes, they are flexible and accommodating. 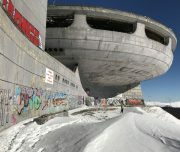 But are they willing to hike to Buzludzha from the entrance below instead of driving to the top? Yes. Will they pose with silly hats for photos for a friend’s birthday? Yes. Would they drive across Sofia at rush hour to retrieve a bag I’d left in a shop we’d visited earlier in the day? Yes, yes, yes! The point of a private tour is to have the guides tailor it to your preferences. Nobody does that better than Beni and Tsveti. I’ve tried to think of something they could have done better, but there just isn’t anything. They do everything you can reasonably expect guides to do, and then they start adding things you’d never think of. They do more than communism-related tours. Thracian sights? Check. Roman ones? Yes. 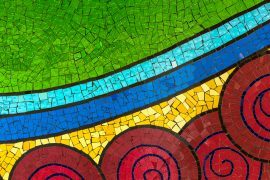 Christian and Muslim sights? Of course. Regardless of your interests, you simply can’t go wrong with Beni and Tsveti.